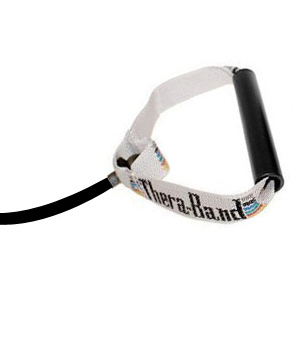 Thera Band Tubing is an alternative to conventional free weights or elastic bands. Athletic Trainers prefer it because the color resistance levels are the same as Thera Band Exercise Bands used in physical therapy. It is also used in occupational therapy, orthopedics, pediatrics, sports medicine, home health care, geriatrics, hand therapy, and Chiropractic. The PVC Handles on these Resistance Tubes are perfect for people who prefer a hard handle as opposed to a softer one. I purchase several Thera Band products from Yoga Direct to continue some PT exercises for an injured spine. Thera Band products are great, and Yoga Direct prices for these products are competitive. Their shipping is quick and they have always offered gracious service when I have had a concern about any order. I've been working with these for about a year now. With bone spurs in both shoulders these keep me limber and functional with a minimum of drugs. The waist line has shrunk too.